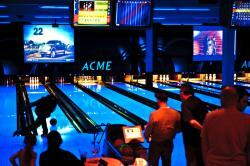 ACME Bowl is the bustling epicenter of bowling in Seattle Southside. 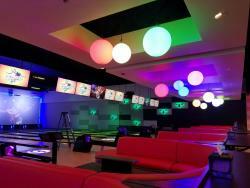 Featuring 30 state-of-the-art bowling lanes, plus a private 10-lane section which can be reserved, you’re guaranteed to get your bowling fix here. In addition to the interstellar neon display that is cosmic bowling, ACME also has plenty of billiards tables, a nice arcade, and some shuffleboard as well. Don’t forget to get some hot eats and cool, drinks at the Breakroom, open all-day, with happy hour from 3:00pm-7:00pm. Did someone say Fishbowl? Round 1 is a Japanese entertainment complex attached to Westfield Southcenter Mall, right across the street from ACME. This sprawling facility seemingly sprang up out of nowhere a year or two ago and we are so glad it did. Bowling is big here, but the arcade is bigger. Arcades: you just don’t see too many of those anymore either, and this arcade is cutting edge. 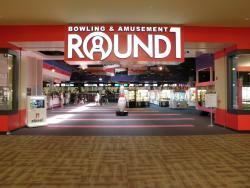 With bowling, gaming, karaoke, food and much more, there’s something for everyone at Round 1. And the best part about Round 1: it’s open every day (seven days a week) from 10:00am-2:00am. *Gasp* Unheard of! The newest spot on the block is really an addition to an old favorite. Bowlwinkle Lanes opened up at Family Fun Center a few months ago, adding yet another amazing attraction to this massive amusement facility. This brand new bowling alley is fantastic for groups and families; not to mention, if you get tired of bowling, they also have batting cages, bumper boats, go karts, laser tag, mini golf, and a whole lot more! Trust me when I say this: you will love it here, everyone will love it here, and there’s plenty to do, rain or shine.